Gifting ideas for ‘her’, any occasion! Let me begin by clarifying that, when I say ‘her’ in my post title, it doesn’t necessarily mean your girlfriend, spouse or your partner. It means, what it would generally mean- mother, sister, daughter, wife, friend, colleague or even you, yourself if you are a woman! Women, in general, they love being pampered, thoughtful gifts can touch the right chords. So, give gifts to them, gift them right. Its great when you’ve choice, isn’t it! Rakshabandhan, Indian festival of brother and sister just went by, the markets were full with plethora of choices. But, somehow I feel, even the choices should be limited, for zeroing down, easy and fast! 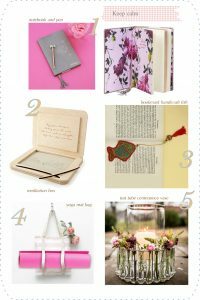 So, this post, a round-up of beautiful gifts for her, a little late and deliberately so as I’ve earlier mentioned, that these could be for anybody. |1| For someone who likes to write notes, reminders, poems or just about anything. |2| I personally quite liked this one- how pocket sand-box can be a handy calming effect. |3| For those who you’ll always find with a book and also for those who just like to collect quirky stuffs. |4| It can be irritating finding a place for yoga mat around home. This one really looks handy and can be hung at a place where you can easily find it. |5| Fresh flowers are universally loved and you are always in the need for a unique flower vase. |6| I’m loving this pedestal jewelry holder, please someone gift me one! |7| A scarf for one’s who get bored easily, wear your scarf and start reading. Joke apart, these scarf come in many classics printed right on the scarf. Choose your favorite. ‘I’m wearing pride and prejudice today’. Well! |8| For those with wings or wheels under their feet, this personal luggage scale is a must have. Now, know how much are you carrying before you travel and remove stuffs that you don’t really need. 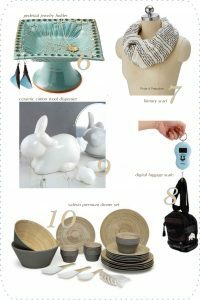 |9| This one is too cute- white rabbit cotton ball dispenser. |10| This dinner set has found its place even before on our website here, and even after so many years, we’ve not found ourselves getting bored of it or this going out of trend. It very well deserves a second mention here in this post. So, these were some of the things which can be great when you are confused what to gift her. But of course, since all of us are different, we can’t guarantee, it’ll be liked for sure. Sometimes letting them know what you are thinking of gifting them is better than a surprise!